Brenda Mossbarger was sworn in Friday, March 8 for her official term, starting March 11, as the Fayette County Auditor. Her family joined her as Fayette County Probate/Juvenile Court Judge David Bender performed the ceremony. Mossbarger was also joined by her staff, whom were also sworn in. Holding the Bible beside Mossbarger (left) are her daughters, Brooke and Ashleigh. Mossbarger said she is very happy and excited to be back in the office and looking forward to getting everything in place to serve the public as needed. 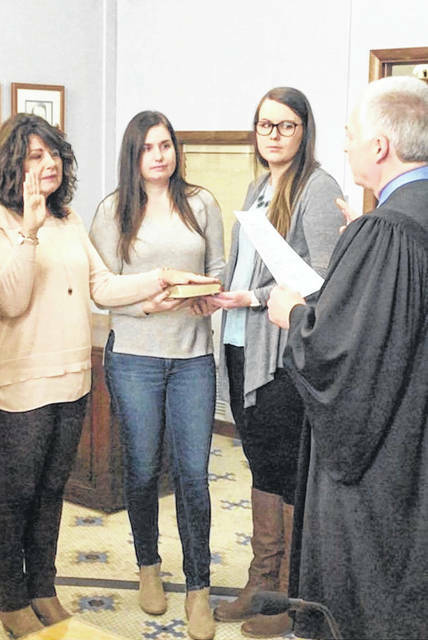 https://www.recordherald.com/wp-content/uploads/sites/27/2019/03/web1_received_304815233533154.jpgBrenda Mossbarger was sworn in Friday, March 8 for her official term, starting March 11, as the Fayette County Auditor. Her family joined her as Fayette County Probate/Juvenile Court Judge David Bender performed the ceremony. Mossbarger was also joined by her staff, whom were also sworn in. Holding the Bible beside Mossbarger (left) are her daughters, Brooke and Ashleigh. Mossbarger said she is very happy and excited to be back in the office and looking forward to getting everything in place to serve the public as needed.